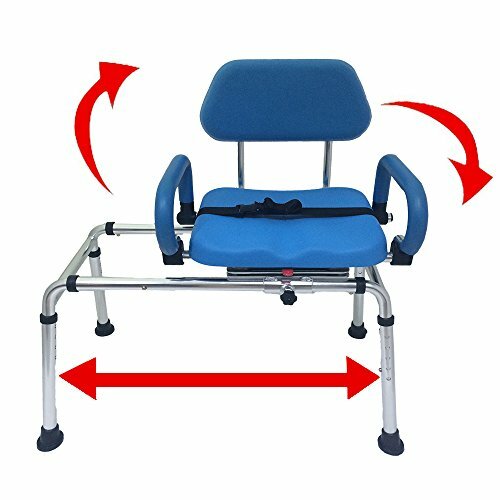 The Carousel premium, padded, sliding transfer bench and bath/shower chair is the perfect bathroom aid for individuals with decreased and/or painful mobility challenges. It is the only transfer bench designed to eliminate both falls and skin tears. In addition, the swivel seat eliminates the need for the device to protrude inconveniently into the bathroom like many old-style, non-swiveling models. The Carousel is the only transfer bench that incorporates a padded seat base, backrest and pivoting armrests for the ultimate in safety and comfort. The soft padding prevents skin tears and feels much warmer to the skin than standard hard plastic models. All surfaces are easy to clean and disinfect. The quick, tool-less height adjustment feature allows the Carousel to integrate perfectly with virtually every tub on the market. The frame is constructed of rustproof aluminum for years of reliable use. Designed by front-line healthcare workers with decades of experience in safe bathing and transfers, the Carousel is considered the best-in-class transfer bench/bath/shower chair product by nurses, physiotherapists and doctors across the country. Overall Horizontal Travel Of Seat: 12". Width Between Armrests: 20". Leg Height Adjustment Increment: every 0.5". Overall Width Of Frame (Right to Left): 34" in highest position setting and 33" in lowest position setting. Height To Top Of Backrest: 35" in highest position setting. Overall Depth Of Frame (Front To Back): 20" in highest position setting and 22" in lowest position setting. Seat Height Adjustment: 19" lowest, 23.5" highest. Seat Belt is Included. 330lb Weight Capacity.